this property is an elegant and welcoming independent house situated a few miles from the historic center of Siena. It sleeps four people. From this property you will enjoy a gorgeous view of the Senesi hills and of the greenery. this property is 40 square meters (430 square feet). It features a shared swimming pool, a private patio, a private garden, winter heating and WI-FI Internet access. You will be roughly 5 km (3.1 miles) from Siena, where you will find restaurants, shops and public transportation. You will find the bus stop at 50 meters (165 feet). You will reach this property from the entrance of the building going down a short route that crosses the garden through a pathway and includes approximately 15 stairway steps. The swimming pool is 8 meters (26 feet) large by 15 meters (50 feet) long, 2.5 meters (8 feet) deep. The swimming pool area is equipped with tables, chairs, sun umbrellas, deck chairs and sun loungers. From the swimming pool you will enjoy a spellbinding view of the Senesi hills and of the greenery. You will share the pool with the other guests staying at the complex, and there will be an area reserved for your exclusive use. It is open from the beginning of May until the end of September, from 9 am to 7 pm. The garden is 10000 square meters (108000 square feet) large. It is partly shaded by perfumed trees and by tall pinetrees. It is equipped with tables, chairs and sun umbrellas. Here you will also find a barbecue. From the garden you will enjoy a spectacular view of the Senesi hills and of the greenery. You will share the garden with the other guests staying at the complex, and there will be an area reserved for your exclusive use. The patio is 15 square meters (160 square feet) large. It is partly shaded by tall trees. It is equipped with a table and chairs. Here you will also find a barbecue. From the patio you will enjoy a broad view of the garden. The living room is paved with Tuscan terracotta tiles. The furnishings are classic and welcoming. The furnishings include two sofas. In the living room you will also find a cooking area. The kitchenette is equipped with a four-burner gas cooker, an electric oven, a refrigerator with freezer, a dishwasher, a microwave oven, an Italian-style coffee-maker and other small appliances. The dining table can accommodate four guests. In this room you will find a flat-screen satellite television (local channels). The room has a high window. You will be able to enter the first bedroom from the living room through an access area. The bedroom has a matrimonial bed (160 cm/62 inches, wider than a queen-size bed). The room has a window with a view of the hill. You will be able to enter the second bedroom from the climbing four steps. It has two twin beds (80 cm/32 inches). The room has a window with a view of the greenery. The bathroom is decorated with majolica tiles and equipped with a washbasin, a toilet, a fully enclosed shower and a hairdryer. You will be able to enter the bathroom from the living room through an access area. 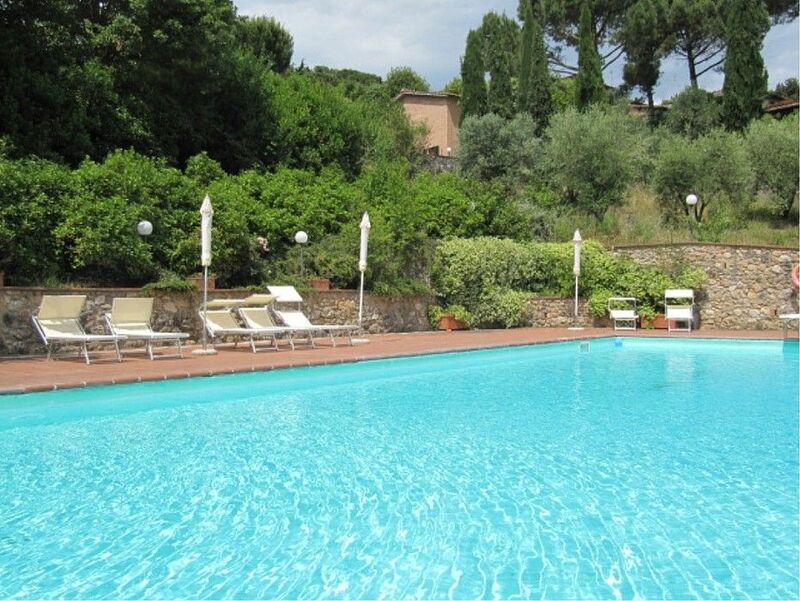 This villa, in Terrenzano, is a comfortable property sleeping 4 people. The villa offers superb accommodation, including modern luxuries such as a community pool, internet access and a television. This wonderful villa allows pets.